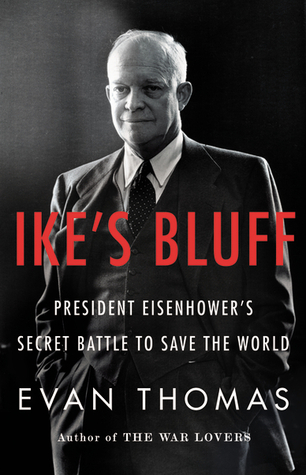 “Ike’s Bluff: President Eisenhower’s Secret Battle to Save the World” by Evan Thomas was published in 2012. Thomas is the author of nine books; he was a writer and editor for over three decades at Newsweek and Time Magazine. He also taught journalism for over a decade at Harvard and Princeton. His most recent book, “Being Nixon: A Man Divided,” was published in 2015. Not intended to be comprehensive, Thomas’s book is almost exclusively focused on Eisenhower’s two-term presidency – and on foreign policy issues, in particular. The author’s primary thesis is straightforward: by implying he might use nuclear weapons in a conflict with the Soviet Union (even if only a “bluff”) Eisenhower insured they would never be used by any nation. But because Ike never revealed his inner-most thoughts to anyone, it is a thesis which ultimately cannot be proven. Thomas’s narrative generally proceeds chronologically through Ike’s presidency, beginning with his inauguration in 1953. But there are numerous side-trips and diversions – particularly in early chapters – that look back into his pre-presidency and provide anecdotes and observations which assist in filling out his portrait. Readers familiar with Eisenhower’s life will recognize these detours as the author pieces together Ike’s persona. Others, however, may feel as though they are watching a jigsaw puzzle being haphazardly assembled. Ardent fans of the thirty-fourth president will notice that Thomas provides no new significant revelations about Eisenhower and few new penetrating insights. What is new is the emphasis Thomas puts on Eisenhower’s “Cold War” strategy and the author’s reliance on diaries from, and interviews with, his subject’s aides, secretary, doctor and family members which reveal fresh nuances about this president’s character and personality. While not possessing quite the dramatic style of David McCullough or Candice Millard, Thomas has a journalist’s eye for detail and knows how to engage his audience. And rather than becoming bogged down with stiff, scholastic explanations of complex events (such as the genesis of the Korean War or the CIA’s involvement in an Iranian coup) he is able to distill the essence of those moments into crisp, comprehensible observations. Several aspects of the book are particularly noteworthy for being exceptionally descriptive, informative or insightful. Among these are the portraits he paints (over several chapters) of Soviet leader Nikita Khrushchev, CIA chief Allen Dulles and Secretary of State John Foster Dulles. In addition, he provides a far deeper and more interesting behind-the-scenes examination of the nuclear arms race during Eisenhower’s presidency than I’ve seen elsewhere. Given the book’s emphasis on foreign policy issues, the author’s decision to reserve significant space for the president’s day-to-day health issues seems unusual. But his role as apologist for Eisenhower’s domestic civil rights record is even more curious. And, more generally, serious readers of history will find the book’s tone tilted slightly toward sensational journalism rather than hard-hitting history. Overall, however, Evan Thomas’s “Ike’s Bluff: President Eisenhower’s Secret Battle to Save the World” provides an interesting if somewhat narrow view of the Eisenhower presidency. Given its scope it cannot replace a traditional biography of Eisenhower. But it pursues an interesting thesis and provides significant insight into his public and private personas and serves as a compelling supplemental text on the thirty-fourth president. I’ve seen this book advertised, but didn’t know if would be interesting or a gimmick. Glad to have you sort it out. Excellent review. I enjoyed this book when it was published. The monographs of David Nichols also provide, in my opinion, keen insight into Eisenhower and his presidency. Does this book mention any of Eisenhower’s regime change in Africa? The otherwise excellent JES book really only mentioned Iran and Guatemala, and the whole Mobutu ordeal in Congo was absent, for example. The situation in Congo is mentioned, though not in significant detail, and mainly in the context of Eisenhower granting wide latitude to the CIA in the area of covert operations.